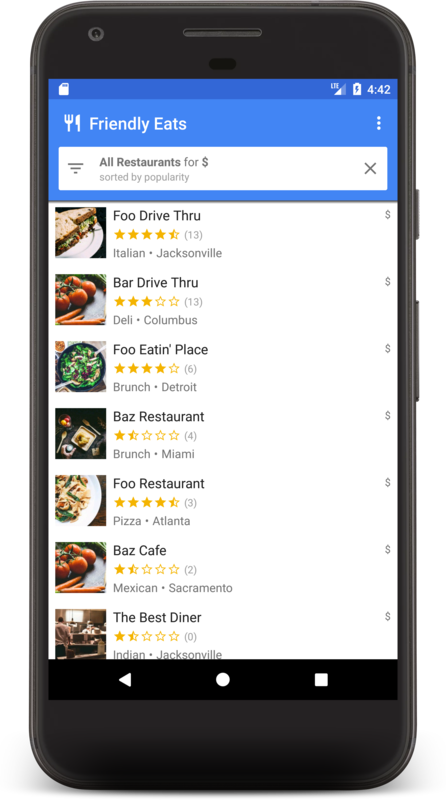 Fire Eats is a restaurant recommendation app built on Cloud Firestore. For more information about Firestore visit the docs. In the Authentication tab of the Firebase console go to the Sign-in Method page and enable 'Email/Password'. This app uses FirebaseUI for authentication. Run the app on an Android device or emulator. // users can create or update. Deletes are not allowed. // can delete it. Ratings can never be updated. When you open the app you will be prompted to sign in, choose any email and password. When you first open the app it will be empty, choose Add Random Items from the overflow menu to add some new entries. 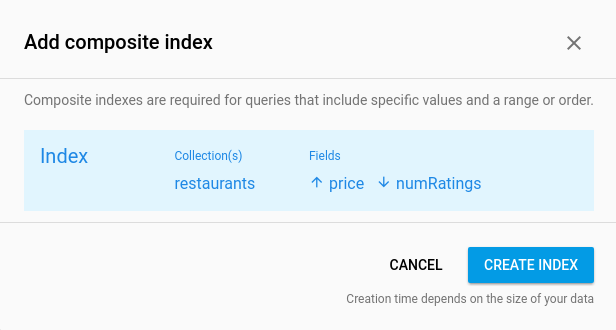 This app also provides an index specification file in indexes.json which specifies all indexes required to run the application. You can add all of these indexes programatically using the Firebase CLI.